Controlling the distance you hit your pitch shots is a critical skill to learn IF you want to score as low as possible. 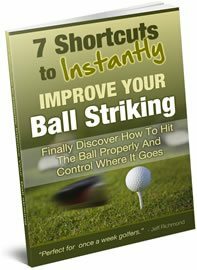 So in this article I’m going to reveal a way that you can train yourself to hit pitch shots the distance you want. To do this you need to find a grassed area where you can hit pitch shots, whether that’s your local driving range, a school or a park. Then I want you to place easily identifiable objects at 10 yard spaces, starting with the first one that is only 10 yards away from you. So place an object at 10 yards, 20 yards, 30 yards, 40 yards, 50 yards, 60 yards etc., right the way up to 80 or 90 yards. Once this is setup then choose a club you normally pitch with and pitch just one ball to each object. Before each shot however, say to yourself the distance you’re hitting the ball. So to start with you’d say….“10 yard pitch shot” and then you’d hit the ball. Then you’d say “20 yard pitch shot” and then you’d hit the ball. Here’s a very important point… don’t ever hit two balls to the same object twice in a row, because you don’t get two chances on the golf course do you? Start this drill by hitting to the closest object then hit to the next object and the next, and so on. But after you’ve gone through all the objects once then mix up the distances you’re hitting your pitch shots. So for example, hit one shot to the 20 yard marker. The next to the 60 yard marker. Then the next to the 10 yard marker etc. Doing this over and over again will help you to gauge how far you have to swing back and through, to hit your ball consistently the distances you want. 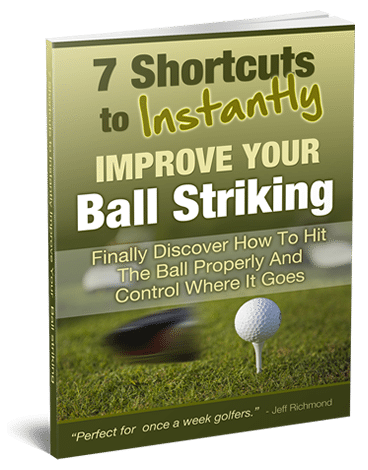 This of course will greatly improve your pitching consistency on the course, as long as you can easily and quickly tell distances from your ball to your target. To do that you should use a range finder. Having information on how far it is to your target will greatly help you in your confidence over a shot, because you will be able to associate a certain distance to what you’ve practiced during this pitching drill.